The Apple iPhone 4 has been a huge hit and with the iPhone 5 launch being delayed to September, it will be the smartphone every new Android device will be compared to. And though it’s almost an year old now, comparisons of the iPhone 4 with new Android phones are inevitable, as it is one of the best smartphones known to mankind. 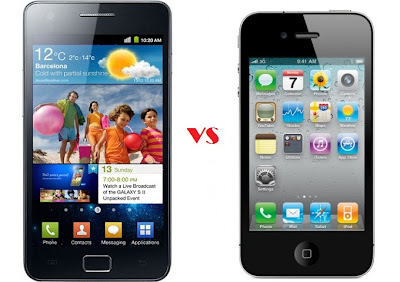 In this post, I will pit the new Samsung Galaxy S 2 against the Apple iPhone 4. Expect some fireworks. While design preferences are subjective, I can safely say that both the Galaxy S 2 and the iPhone 4 have very stylish designs. The iPhone 4 has dimensions of 115.2 x 58.6 x 9.3 mm while the Galaxy S 2 has dimensions of 125.3 x 66.1 x 8.5 mm. The Galaxy S 2 is the slimmest smartphone around, slimmer than even the anorexic Sony Ericsson Xperia Arc. It is also very light, with a weight of only 116 gms compared to the iPhone 4?s 134 gms. I would prefer the Galaxy S 2. The Samsung Galaxy S 2 comes with a 4.3 inch capacitive SuperAMOLED Plus display with a resolution of 480 x 800 pixels. It is easily the best display in town, in terms of size, contrast, display quality etc. It is perfect for watching videos and movies. The iPhone 4 comes with a 3.5 inch IPS LCD ‘Retina’ display with a resolution of 640 x 960 pixels. It is one of the best displays in the market, but loses out before the Galaxy S 2 in terms of size as well as overall quality. Again, the Galaxy S 2 wins. The Samsung Galaxy S 2 easily trumps the iPhone 4 when it comes to hardware, but that is obvious, as it is yet to be launched, while the iPhone 4 was launched in June last year. The iPhone 4 comes with a 1 GHz processor with 512 MB RAM and 16/32 GB internal storage. The Galaxy S 2 comes with a 1.2 GHz dual core Exynos processor and 1 GB RAM. It also has 16/32 GB internal storage and supports microSD cards. Now this is the part where we have two completely divided camps. Some prefer iOS with its ease of use, great user interface, huge library of apps and games (almost 400,000) while some prefer Android with its openness, customizability, better multitasking, and not-as-huge library of apps and games (200,000). With the Galaxy S 2, you get Android 2.3.3 Gingerbread and TouchWiz 4.0 which offer excellent performance thanks to the powerful hardware. There is no clear verdict in this section, but I would prefer the Galaxy S 2 with Android. Just my preference. The Samsung Galaxy S 2 has an 8 MP camera with autofocus and LED flash. It can shoot 1080p videos at 30 FPS and also comes with a 2 MP secondary camera. It is second only to the Xperia Arc and the Nokia N8, in terms of image quality. It definitely blows the iPhone 4?s 5 MP camera out of the water. The Galaxy S 2 is a clear winner in this department. The Galaxy S 2 can play any video format which currently exists on Planet Earth. It’s a pleasure watching videos on the 4.3 inch SuperAMOLED Plus display, going by all the reviews I have seen. It is THE device to have if you want to watch videos on the move. It wins. Both the iPhone 4 and the Galaxy S 2 have excellent web browsers, both default and third-party. But as the Galaxy S 2 has a bigger display, and also supports Flash, I would go with it. As you can clearly see, the iPhone 4 is now outdated. The Samsung Galaxy 2 is quite obviously the best smartphone on the market. It should be launched soon, and I expect it to be the best Android phone of 2011.